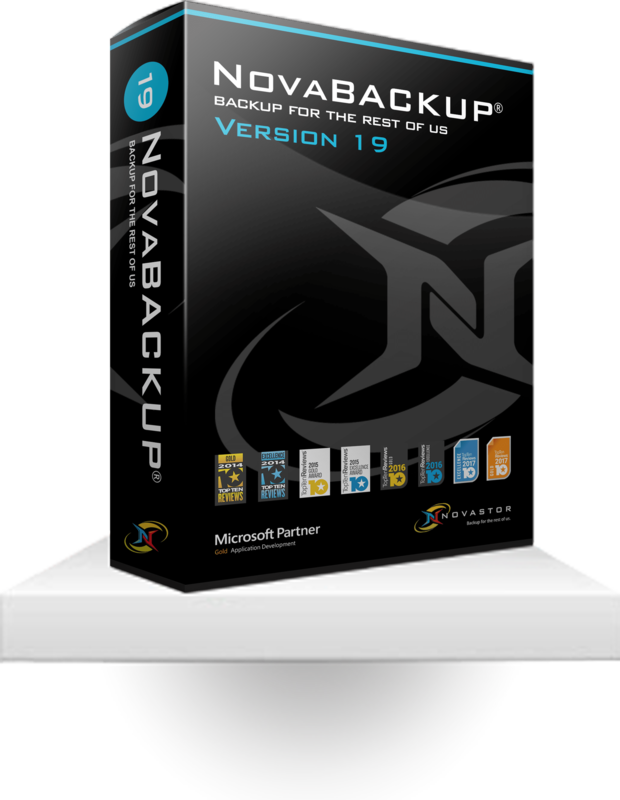 NovaBACKUP PC is simple, powerful, automatic PC backup software that doesn’t take an IT expert to use… but comes with one if you need it! Local backup software creates redundant copies of your files on local media devices. These extra copies can come in handy if you ever accidentally delete something or if your PC falls victim to a malicious attack. It's also a good idea to have multiple devices with the same backups in case disaster strikes twice. NovaBACKUP PC offers top-notch computer backup protection combined with the fastest performance available. And whenever you're ready, upgrading and expanding your backup plan is easy. NovaBACKUP PC tested 4x faster than the nearest competitor. And you can use automatic scheduling to backup bit-level or incremental changes, in between your full backups – ensuring your data is always protected, without needing to continuously run full backups. NovaBACKUP PC guards your data with military-grade, 256-bit AES encryption so your files stay protected until it's time to recover them. Upgrades just require a new key code – no reinstallations and no extra plugins are required. Local and cloud backups in one solution. NovaBACKUP PC let's you easily manage local and cloud backups, all from one interface. Get 2GB of free cloud storage space to get you started. Plus, you can now securely backup to popular file sharing services like Dropbox and OneDrive for free cloud storage. 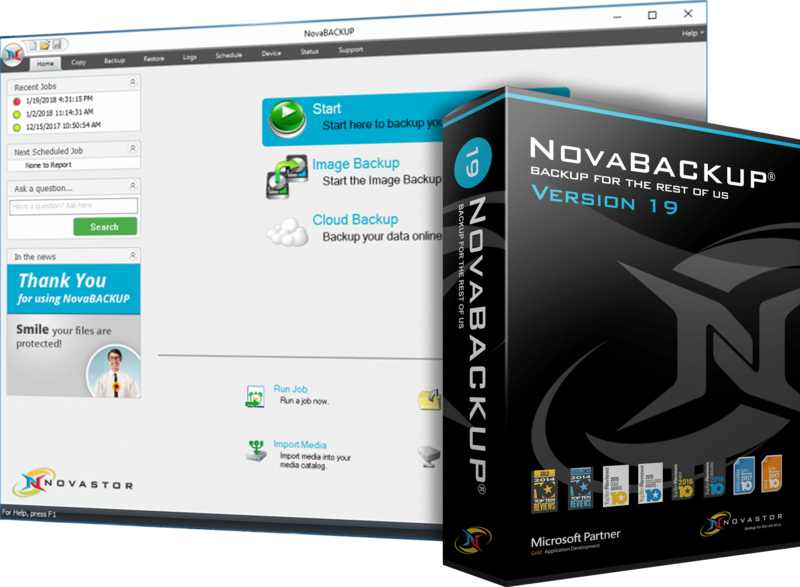 With easy installation, simple step-by-step wizards, and automated backups, NovaBACKUP PC makes it easy to protect your data. Get your first backup up-and-running within minutes. Our local small business backup experts are here for you, ready to help with one-on-one support - like your own personal IT department. NovaCare – Local tech support and upgrade protection. NovaBACKUP PC now includes our industry-leading NovaCare support. That means unlimited access to phone, email, and live chat help from our local, one-on-one support engineers, unlimited product updates, and unlimited access to a vast library of helpful guides and documentation. Our technical support team is located right here in the USA, NOT overseas call centers. You get assistance directly from NovaStor engineers who truly understand backup, and have the product expertise to address your unique needs. If you need support during your trial, or after you have purchased, just visit our support site at support.novabackup.com and we can get started! Or visit our support page to learn more about our support options. Always Microsoft-ready, with full Windows PC OS support. NovaBACKUP is always Microsoft ready, and support for the latest OS comes standard – including Windows 10, 8.1, 8, and 7(SP1). Integrated support tab for 24-hour assistance. Get access to backup support at the click of a button, 24 hours a day. View our FAQ’s, knowledgebase, product documentation, how-to videos, or make a support request directly from within the NovaBACKUP application. NovaBACKUP® PC -- Includes world class software, access to local technical support, and free upgrades to our latest versions! Instantly recover your entire system to any virtual environment. Here's what our customers have to say: NovaStor's backup and restore software has helped businesses keep their data protected. "NovaBACKUP Professional is the first program that worked for me as advertised. I have already successfully restored the system at my cafe. Thank you very much for your great backup software. It's the best!" "Many software manufacturers advertise words like 'simple, intuitive, and easy-to- use' but can’t deliver. NovaStor exceeds those words delivering value and quality." Timothy Harvey, Director Heritage Equity Group, Inc.
"Thank you for your courteous and helpful response to my call. Your technical support guys have been great to deal with. I give them a 10 out of 10 score." "We have implemented NovaStor because the software and configurable options are not available in any other software package offered by any other competitor. Let’s be honest, your backup is only as good as your restore... In our testing environment we have never had an issue doing a restore of ANY data, and the Disaster Recovery image works extremely well at our medical clinic." "We've migrated through several backup software solutions in our fourteen years in business. NovaStor is by far the most robust and reliable product we've used. It's fast and easy to use, and the centralized dashboard is a real benefit when you are responsible for as many clients' backups as we are."